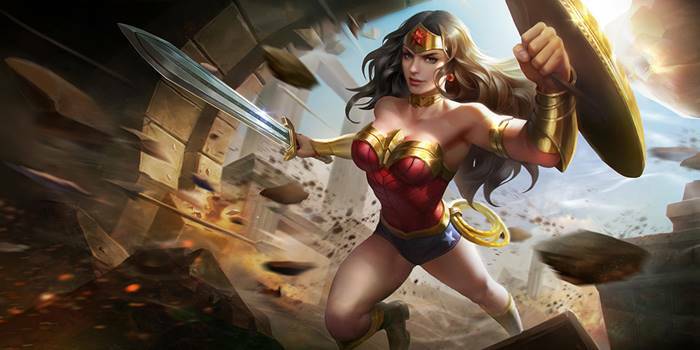 A guide to Arena of Valor's Wonder Woman, the Amazon of Themyscira. Wonder Woman uses her Sword, Shield, and Lasso to infiltrate enemy teams. She roughs up the enemies before smiting them with her Bracelets of Submission. Wonder Woman is an exceptional warrior hero who is potent at singling out priority targets, starting team fights, and supporting her team during clashes. Her kit is very versatile, allowing her to easily move around the battlefield and deal large amounts of damage to her foes. Excellent Initiator – Wonder Woman excels at taking the fight to her opponents. Her Lasso of Truth is a great tool for initiating, she then able to follow up with Sword and Shield and her normal attacks. When her team needs some breathing room, her ultimate, Bracelets of Submission, grants a shield to allies behind her while damaging and stunning enemies in front of her. Good at Ganking – Lasso of Truth gives Wonder Woman some decent ganking potential, especially when she starts to roam around the map. Given its unique mechanic, she can either reel in a low health target or jump toward an enemy at full health before attacking. Decent Damage – Wonder Woman’s abilities enable her to deal a large amount of damage on her enemies. Her Amazon Shield passive allows her to trade with single opponents and heal some HP. Sword and Shield, Lasso of Truth and Bracelets of Submission are excellent damaging abilities in team fights. Hero Mastery Required – Wonder Woman is a hero who is easy to use but difficult to master, especially at higher ranks. Players should learn the best times to use her Lasso of Truth to either engage or to yank an enemy away from their team. The same could be said about Bracelets of Submission as well, proper timing and positioning needed to maximize its potential in matches. Jack of All Trades, Master of Few – Yes, it’s cliche, but it’s true in this case. Wonder Woman is a well rounded warrior but won’t have quite the same potential in either durability or damage. As she will often be up in the Slayer lane dueling other warriors, she can struggle at times keeping her lane. Try to go for the Slayer lane, Wonder Woman benefiting more from extra experience than gold. During the laning phase, trade damage with your opponent using normal attacks, hitting them with Amazon Shield to replenish lost HP. Make sure to bring in Sword and Shield as well to maximize your damage output. After getting Lasso of Truth, cast it low health enemies to reel them toward you and prevent their escape. If they have more than 50% health when you lasso them, you will pull yourself towards them instead. Once you’ve reached level 4, get Bracelets of Submission and look for team fights or ganks. Your team’s durability will dramatically increase when buffed by Wonder Woman’s ultimate, so remember to position yourself properly. Start with Sword and Shield and focus on leveling it to max first. It is Wonder Woman’s main damaging tool and additionally offers a bit of protection as well. Lasso of Truth is your lowest priority. While a useful engagement tool, it has less value than anything else in Wonder Woman’s kit. Finally, get Bracelets of Submission whenever you can. Wonder Woman’s ultimate is invaluable, especially during team fights. Team Battle: Cast Lasso of Truth on the enemy team’s squishiest hero. Once you pull yourself onto them, cast Sword and Shield on the enemy carries. Use your normal attacks to proc Amazon Shield and thereby recover some lost HP. Should things get dicey, cast Bracelets of Submission with your teammates behind you and the opponents in front of you to maximize the skill’s utility. Escaping Team Fights: Both Sword and Shield and Lasso of Truth can be used to escape unwanted or failing clashes. When using Sword and Shield as an escape tool, simply cast it away from the battle. Getting close to terrain will let you pass through it as well. In addition, you can cast Lasso of Truth on enemy minions or jungle monsters to pull yourself towards them. This will let you quickly cover ground and escape from pursuers. Amazon Shield – Passive – After 2 normal attacks, Wonder Woman’s next normal attack will throw her shield, dealing an additional (0.5 AD) true damage to all enemies in its path and slowing their movement speed by 50% for 0.5 second. If the shield hits an enemy, Wonder woman will recover 10 (+7 each level)(+0.1 AD)ˀ HP. If the shield hits an enemy hero, the HP recovered is tripled. Amazon Shield lets Wonder Woman regain HP every third normal attack. This is a very good tool for poking enemies and for recovering from trades. Sword and Shield – Wonder Woman repels her enemies with her sword and shield. Her shield bash deals 40/80/120/160/200/240 (+0.6 AD) (+5% of the target’s maximum HP) physical damage and slows enemy movement speed by 20% for 3 seconds. If the shield hits an enemy hero, Wonder Woman will receive 15/16/17/18/19/20% damage reduction for 3 seconds. After Wonder Woman bashes with her shield, she can activate the ability again to follow with a sword attack that deals the same amount of physical damage. Enemies hit by the center of her blade suffer double damage. Sword and Shield is Wonder Woman’s main damaging ability. Use it as often as possible when fighting. Throw out some basic attacks in between casts. This will both keep your damage potential high and pace the dashes in a way that makes it harder for your enemy to escape. Sword and Shield can also be used to cover ground or escape unwanted fights. Casting through thin walls will allow Wonder Woman to pass through them. Lasso of Truth – Wonder Woman throws her Lasso of Truth around an enemy. If the enemy’s HP is greater than 50% of their maximum HP, then Wonder Woman will be pulled towards them, dealing 250/300/350/400/450/500 (+1.0 AD) physical damage. When the enemy’s HP is less than or equal to 50% of their maximum HP, Wonder Woman will pull them towards her, dealing 250/300/350/400/450/500 (+1.0 AD) physical damage. If Wonder Woman hits an enemy with this ability, the cooldown will be reduced by 3 seconds. Targets hit are stunned for a short period of time. After taking a rank in Lasso of Truth, heroes under 50% health will be marked with a symbol. Lasso of Truth can also be used to evade ganks – cast this on neutral monsters or enemy minions to reel yourself onto them. This will allow you to create some distance between you and the enemy heroes. Bracelets of Submission – Wonder Woman builds up her energy and then slams her bracelets together, unleashing an energy wave that deals 400/550/700 (+1.0 AD) physical damage to enemies in front of her and stunning them for 0.75 seconds. Wonder Woman and allies behind her receive shield that absorb 600/800/1000 (+12% of her own maximum HP) damage for 3 seconds. Wonder Woman will receive high amounts of damage reduction. Proper positioning is essential to using this skill well. Use it from the front lines to affect as many enemies and allies as possible. Once Wonder Woman engages your team, retaliate by bombarding her with hard crowd control abilities. This way, she’ll be unable to follow up with her damage or use her ultimate to protect her allies. Onslaught, Assassinate, and Skewer are good Arcana on Wonder Woman as they empower all of her abilities and normal attacks, increasing her damage potential. She can also run a defensive arcana set, such as Indomitable, Benevolence, and Valiance to help her soak more damage for her team, especially when she initiates team fights. Wonder Woman fairs well against tanks so long as she avoids getting disabled. Given that her kit allows her to deal damage in short bursts and move more quickly than lumbering tanks, she can outmaneuver and punish them with her abilities and basic attacks. When it comes to dealing with warriors, Wonder Woman’s success will depend on how well she can outplay them. Thanks to her Amazon Shield and Sword and Shield abilities, she is more than able to poke and harass them to death. Avoid long battles with other warriors, however. Many have damage that is more consistent than Wonder Woman’s bursts. Wonder Woman does okay against assassins. Most assassins rely on burst damage, which Wonder Woman should be able to withstand after getting some durability items. The dashes and movement her kit allows will keep them from outmaneuvering her and, as a result, less effective at killing her. Wonder Woman generally struggles against ranged heroes. A mage’s damaging abilities can be a big nuisance to her, able to burst away her health or zone her away from fights. Moreover, most mages tend to bombard their enemies from a safe distance. If Wonder Woman cannot get close to them, she’ll have a very hard time. In the same vein, Wonder Woman has a hard time dealing with marksmen since they can harass her with ranged attacks and punish her if she decides to dive. However, after getting her defensive items, she can deal with these ranged heroes effectively. Wonder Woman does pretty well against support heroes in one on one settings. However, support heroes tend to give Wonder Woman some trouble during team fights with their defensive and control abilities.